Video analysis reveals a sophisticated level of flight coordination among bird mobs. 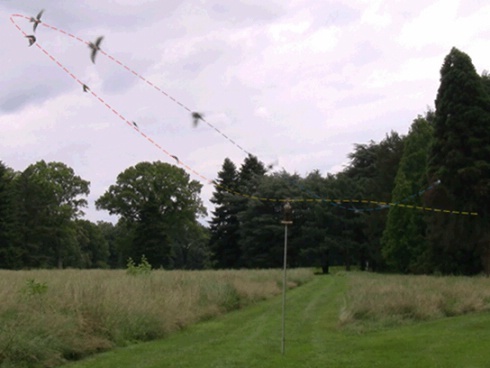 Last summer, physicist Suzanne Amador Kane at Haverford College in Pennsylvania set up an experiment looking at how flocks of small birds on her campus -- swallows -- defend themselves from predators by ganging up and forming mobs. Mobbing is a fascinating phenomenon, says Kane, because by definition mobs have no hierarchical structures -- there is no pecking order, no lead bird flying out in front for the rest to follow. Nevertheless, ecologists in the field have observed some level of organization within bird mobs. When attacking a single predator, mobs of smaller-sized birds will appear to attack in a highly coordinated fashion. This is exactly what Kane observed. Working with Haverford student Elias Tousley and Owen Glaze, a local high school student, Kane found that the mobbing swallows were quite sophisticated in their attack. To study the coordination between attacking birds, Kane videotaped a scarecrow made by mounting a stuffed red-tailed hawk on a perch atop a pole located in an open field with available tree coverage nearby. It took no coaxing to attract a mob of local swallows -- typical prey for the local red-tailed hawk predator -- to harass the scarecrow. The swallows mobbed the stuffed hawk with such enthusiastic, in fact, that Kane had to break up the sessions for fear that the swallows would neglect their nests for too long. "What we see is that mobbing is highly periodic," said Kane. The videos show about a dozen birds mobbing at a time, following a roughly elliptical orbit -- like an exaggerated planet's motion around the sun. Kane's analysis revealed that the birds seemed to have had a preferred attack frequency, and were constantly changing their flight speed and angles in a highly coordinated fashion during the attack. In the videos, there always appears to be one bird swooping in on a closest approach. "It's likely that they're timing their attacks in such a way so as to avoid capture," said Kane, commenting to a reporter after Tousley presented the work in March at an American Physical Society meeting in Portland, Ore. The research is relevant to robotics, Kane adds, because this defense mechanism may help engineers design methods for coordinating the motion of swarms of robots.